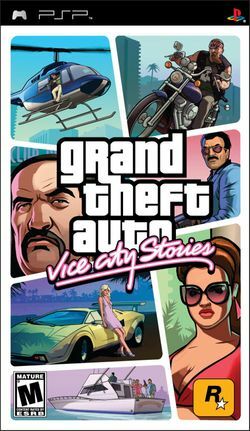 Grand Theft Auto: Vice City Stories was originally released in North America on October 31, 2006 for the PlayStation Portable. It is the second Grand Theft Auto on the PSP (the first being Grand Theft Auto: Liberty City Stories) and the ninth game in the series. The game was later ported to the PlayStation 2 on March 6, 2007 and the PlayStation 3 release date on April 2, 2013 without any of the multiplayer components of the original. The game takes place in Vice City, 1984. The game starts out on the second island in Grand Theft Auto: Vice City at the military base near the airport where you start out playing as Victor Vance, the brother of Lance Vance from Grand Theft Auto: Vice City. Vic Vance recently joined the army to help out his dysfunctional family. Victor's family are his, brothers, Lance and Pete Vance, where as Pete has asthma and is sick while Lance is "Sick in a totally different way." as Vic says. His mother, Janet Vance, has an addiction to cocaine. Not being a fit parent the three Lance brothers were raised by their Aunt Enid. Only being a Corporal, Vic gets a Dishonorable Discharge from the army. Now he must protect his family through a difficult life. This page was last edited on 29 February 2016, at 09:11.